Today I will show how to make digital bridge between Arduino and PC: control analog – digital converter and send measured data to PC. Windows application will be created using Visual C++ 2008 Express. 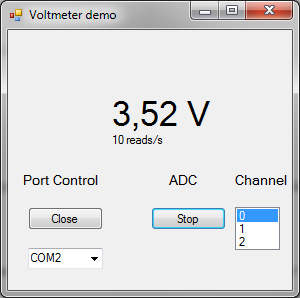 Voltmeter demo software is very simple, and here is a lot room for improvement, but I just wanted to show basics how to control com port and execute data exchange between PC and Arduino. This entry was posted in Arduino and tagged ADC, communication, RS232, serial port, visual c++ on October 4, 2010 by Darius.